Bulgarian rabbi and author; born in Sarajevo, Bosnia; died in 1824. He held the office of rabbi in Silistria, Bulgaria, till his death. He led a religious life, taking little food, and restraining himself from every kind of pleasure; hence he was surnamed "the Saint" ("ha-Ḳadosh"). 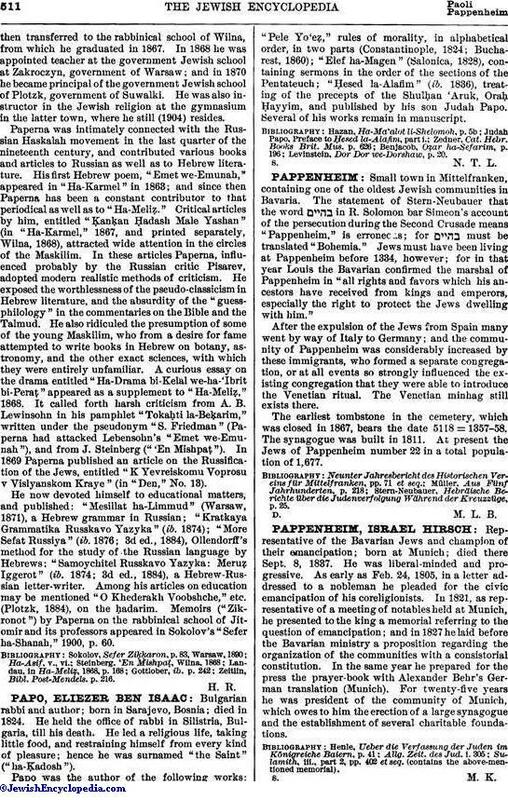 Papo was the author of the following works: "Pele Yo'eẓ," rules of morality, in alphabetical order, in two parts (Constantinople, 1824; Bucharest, 1860); "Elef ha-Magen" (Salonica, 1828), containing sermons in the order of the sections of the Pentateuch; "Ḥesed la-Alafim" (ib. 1836), treating of the precepts of the Shulḥan 'Aruk, Oraḥ Ḥayyim, and published by his son Judah Papo. Several of his works remain in manuscript. Levinstein, Dor Dor we-Dorshaw, p. 20.